Following our Award winning, over 1 million units sold, we are proud to announce the new and improved SmartGlobe that features Augmented Reality. We updated our SmartGlobe with the newest worldwide facts. The coolest new feature is our app allows the SmartGlobe to come to life. You can interact with dinosaurs, animals, and famous landmarks. 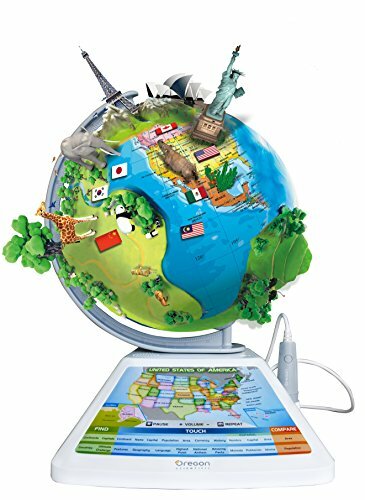 HEAR - The SmartGlobe talks and speaks about lots of fun facts. Listen to the country's national anthem, capital, or history. Over 4,000 information pieces are stored in the globe's digital memory. PLAY - Learn and have fun! Contains 25 games that will teach your children about world facts, while capturing their interest. PORTABLE - Take the globe anywhere. Operates on 3 AA batteries (included) so no cords needed. If you have any questions about this product by Oregon Scientific, contact us by completing and submitting the form below. If you are looking for a specif part number, please include it with your message.